Ryan has promised the House will repeal most of the ACA via an expedited budget reconciliation bill passed on a party-line vote by early April. Divisions sharpened last week between hard-right and more pragmatic Republicans over both policy and strategy for repealing and replacing the Affordable Care Act. Those differences—along with the apparently slow progress in drafting actual legislation that could be scored by the Congressional Budget Office on cost and coverage impact—underscore the tough struggle Republicans face in dismantling Obamacare and establishing an alternative system. One of their biggest disagreements is over the future of the ACA's expansion of Medicaid coverage to more than 10 million low-income adults. Conservatives want to eliminate it while a number of GOP senators and governors want to keep that coverage. Congressional Republicans are feeling growing pressure to show progress on healthcare. Many are going back to their districts this week and holding town hall events, where they may face constituents who are upset about the potential loss of their ACA coverage. In addition, insurers are signaling they may pull out of the individual market in 2018, as Humana announced it would do last week. House Speaker Paul Ryan promised Thursday to introduce repeal-and-replace legislation when the House returns from recess on Feb. 27, though he's presented no legislative language so far. He said he's waiting for the CBO and the Joint Committee on Taxation to score his proposed bill on costs and coverage levels before it's unveiled. Ryan has promised the House will repeal most of the ACA via an expedited budget reconciliation bill passed on a party-line vote by early April. He's indicated it will include some replacement features, such as expanded health savings accounts and age-based premium tax credits. GOP leaders want to erase most of the ACA taxes that fund the law's coverage expansions and replace them with a cap on the tax exclusion employees receive for employer-provided health benefits. Two people familiar with Ryan's proposal told the Associated Press that employees would pay taxes on the value of coverage above $12,000 for individuals and $30,000 for families. Republicans would not confirm those amounts. But House Ways and Means Committee Chairman Kevin Brady told reporters that the “vast majority of Americans” would be unaffected. That suggests it wouldn't raise much revenue. That proposal is likely to trigger strong opposition from business and labor groups and from many conservative congressional Republicans, who may see it as a new tax. The day before Ryan's announcement, leaders of the very conservative House Freedom Caucus, joined by Sen. Rand Paul of Kentucky, demanded that Republicans quickly repass their 2016 budget reconciliation bill to repeal most of the ACA, without worrying about replacement provisions. They touted Paul's Obamacare Replacement Act, a bill that almost certainly would leave millions of people currently covered under the ACA uninsured, as their alternative. Rep. Mark Sanford of South Carolina has introduced a companion bill in the House. 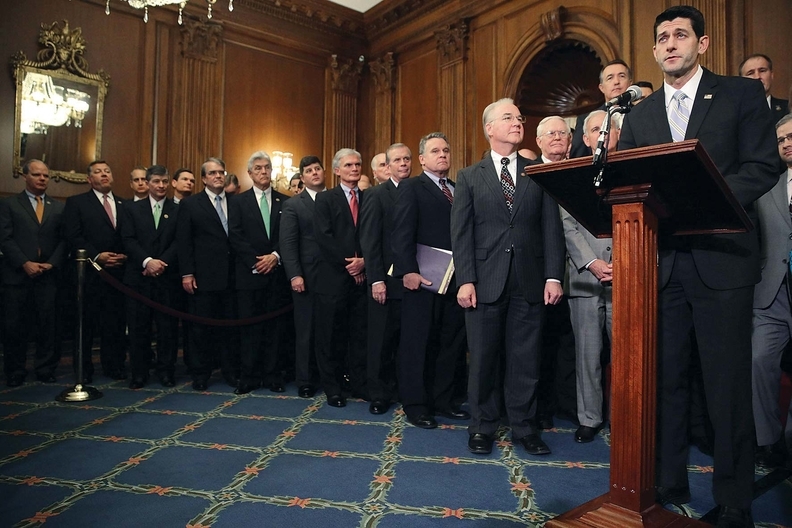 The 2016 repeal bill would erase federal funding for the Medicaid expansion after two years. Asked whether the nearly 40 House Freedom Caucus members would work with Senate Republicans on maintaining some form of Medicaid coverage for those who have received it, Rep. Mark Meadows, the caucus chairman, ruled that out. He said his members want to repeal the expansion entirely and offer health savings accounts to help that low-income population. After seven years of promising to repeal and replace the ACA, Republicans have yet to coalesce around a plan, and more party members are facing the consequences of pulling coverage from nearly 20 million Americans. Meanwhile, Senate Republicans lunched with newly confirmed HHS Secretary Tom Price, hoping to learn that the Trump administration has a concrete plan that would abolish the ACA while maintaining affordable coverage for the 20 million people who have gotten it under the current law. But senators who attended said they heard no specifics from Price. Sen. Mike Rounds of South Dakota said the secretary promised that the administration would work with Congress on legislation, and that it was making ACA repeal and replacement a top priority. Rounds predicted that crafting legislation would likely take another two months, and the transition to a new system would last two to three years. Rounds sounded a very different note on Medicaid expansion than that expressed by Paul and the Freedom Caucus. Rounds said there was discussion during the lunch with Price of equalizing federal Medicaid contributions between the 31 states that have expanded Medicaid and the 19 that have not, including his own state. But the governors of the expansion states would resist taking away the expansion money that has provided coverage to so many of their residents, and that could derail the replacement plan, he explained. Sixteen states that have expanded Medicaid have Republican governors, including Arizona, Arkansas, Indiana, Iowa, Kentucky, Michigan, Nevada and Ohio. About 20 Republican senators represent expansion states. According to documents obtained by the Associated Press, the GOP leadership plan presented Thursday would sweeten the Medicaid changes for states and healthcare providers by temporarily providing additional Medicaid funding to the states. But it's expected that over time, the amount of federal funding would decline significantly. Still, many experts question whether Republicans will be able to craft a politically acceptable Medicaid restructuring model as part of an ACA repeal bill that could pass by April, given the strong concerns of state elected officials, healthcare industry groups, and patient advocates. The formula for reducing federal funding over time will be particularly contentious. “I think they'll have a hard time capping the federal contribution,” said Michael Leavitt, Utah's former Republican governor and HHS Secretary under George W. Bush. Sen. Lamar Alexander, chairman of the Health, Education, Labor and Pensions Committee, told Bloomberg News last week that his panel is not planning to repass the 2016 repeal bill. The replacement bill offered by Paul and Sanford likely will not satisfy Alexander or even House Speaker Ryan. It proposes a non-refundable $5,000 tax credit to help people afford coverage. But lower- and middle-income people who owe less than $5,000 in income tax would not receive the full amount, and those who owe no tax would receive no financial assistance. In contrast, Ryan's House leadership proposal would provide a refundable, age-based tax credit. It would offer the same premium subsidy to everyone regardless of income. Last week, Paul argued that it's unacceptable to offer a refundable tax credit similar to the ACA's. Instead, he said, his approach would create a “real marketplace” that would drive down prices for medical services and that help lower-income people better afford healthcare. He urged rapid action on repealing the ACA to clear the way for the Republicans' next priority, a tax package to sharply reduce rates for wealthier Americans and businesses. “We have to get it done because we can't start tax reform until we deal with this,” he said. Rounds expressed optimism about the healthcare reform discussions among congressional Republicans, saying legislation “is starting to jell.” But that was not obvious from listening to the very different messages last week from Republicans on the opposite ends of the Capitol.